Google has launched realtime analytics to Google Analytics product. 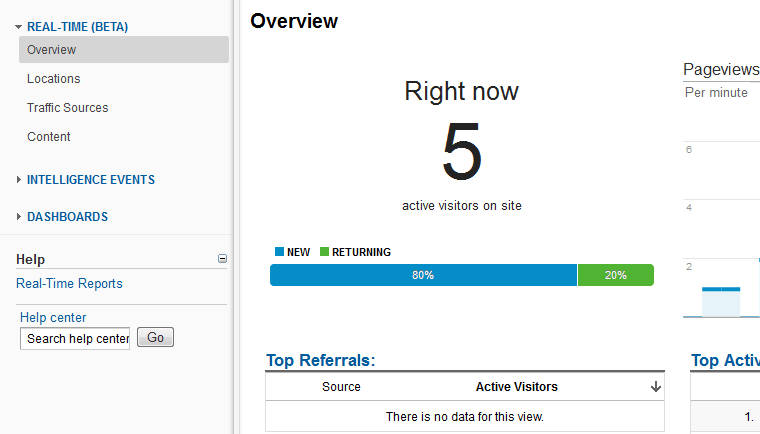 You can see in near realtime how many people are currently active on your site. Realtime analytics also shows the keywords, referring URLs and visitor locations on a map that are updated realtime. Earlier analytics data used to lag by around 3 - 4 hours, Google has made a significant achievement in getting the analytics realtime. However note that you will not have access to Google Analytics realtime if you have limited access to the profile on which you are trying to see analytics realtime. Currently Google Analytics Realtime is in Beta stage, So you might not have access to it. If you dont have access to google analytics realtime yet, you can apply here. Click on Home menu on the main navigation under the Analytics logo besides your website name. This brings up Google Analytics Realtime View. Have fun watching your stats realtime!